TVS Motor Company recently launched the TVS NTorq 125 scooter in India and also showcased it a day later at the Auto Expo 2018. The TVS Ntorq 125 is the first scooter in the country to feature smart connectivity. This is achieved through the TVS SmartXonnect technology that allows the rider access to different types of information. The user can connect to the scooter via Bluetooth. And using a free to download app, he or she can have access to caller ID on the TVS Ntorq's LCD display, so the rider need not take their phone out to check who's calling. It also displays turn-by-turn navigation, last parking location, top speed and average speed, engine oil temperature and, yes, a lap timer. It competes with the Honda Grazia and Suzuki Access 125. The TVS NTorq app also features auto reply SMS, speed limit alert, save the last used route, as well trip reports. And there can be multiple profiles for use by different users. The Ntorq's, 125cc, 3-valve, air-cooled, single-cylinder engine produces 9.4PS at 7,500rpm and 10.5Nm at 5,500rpm. Power is sent to the rear wheel via a V-Matic transmission. 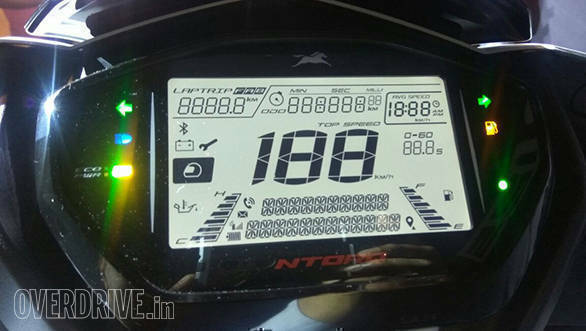 TVS claims the NTorq 125 can sprint from 0-60kmph in 9 seconds and has a top speed of 95kmph. 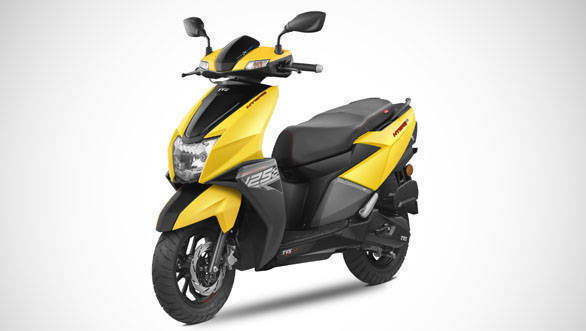 The TVS NTorq 125 is priced at 58,750 (ex-showroom).